When Do Door Sidelights Make Sense? Adding sidelights to front entry doors allows them to enhance the aesthetics of nearly any entryway or foyer. Sidelights can accent your home, highlighting and complementing your front entry door. Door sidelights are commonly added to exterior front entry doors of offices and homes alike. Custom sidelights for exterior doors can be made in almost any type of configuration you might need. They may be made from leaded glass, stained glass or leaded, beveled glass. The glass is typically insulated on each side, to make it more energy-efficient. Door sidelights are made by experienced, highly skilled glass artisans. At Doors of Elegance our team will work with you to create custom sidelight designs, which can be tailored to your specific needs. Exterior door sidelights, often used with solid wood doors, give your foyer more light and a feeling that creates more openness and brightness. They allow the area of the door to bathe the interior of your home with light that is natural and soft, according to e-Home Tips. Sidelights can create an image of simple, vertical windows. This is a simple look that many homeowners and business owners appreciate. Sidelights can create many different types of looks, though. They can be made to allow full light, or they may be crafted with raised panels. 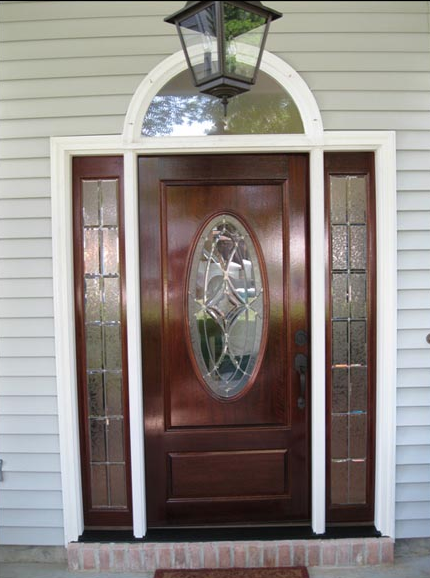 Skilled glass crafters have the ability to work with you to design and then build the right exterior door sidelights that complement wood entry doors. If you want light and openness, but still wish to maintain privacy, door sidelights can be made with translucent textures that allow for incoming light without sacrificing privacy. Exterior entry doors that are well designed give your house curb appeal, and add to the aesthetic beauty of your home. Sidelights can also be designed to give your office a unique and appealing look. There are so many ways to customize sidelights that you’ll enjoy being able to help glass artisans to design just the right look for your office exterior and entryway. Your own ideas can be used to give your office a unique and architectural appeal. Sidelights in your entryway solve problems with darkness in the foyer when night falls. You switch on lights at night, so that visitors can see your porch and door more easily. With sidelights, you can change this atmosphere. Useful yet elegant sidelights are attractive, bathing your entryway in subtle light. Your sidelights may be framed glass of the same height as your door, but a good deal narrower. Sidelights use glass paneling, allowing more natural light inside during the day, while allowing interior light to make your porch more approachable after dark. Sidelights are usually placed on the hinge side of exterior doors, to make them more secure. Otherwise, the window could be broken and might allow someone to open the door lock from the inside.